This was a cool bead to make. 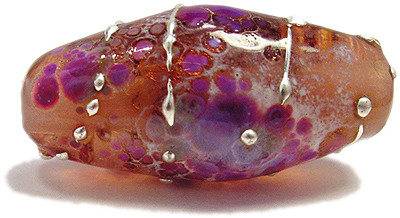 Measuring about 1 1/4 inches, it is made with a base of champagne, and rolled in frit, with whisps of sterling wire. Would look great as a pendant, or even a focal on a bracelet! This bead is on-hand and ready to ship.